It is a heartless, cold and yet a scary reality that shelter staff and rescues experience every day- the unwanted, abused, forgotten dogs of society. This story is about Papa’s journey. It is dedicated to all the people that help dogs like him go on to live the life they deserve. You all are fighting for dogs like this and you should be very proud of yourselves. I know I am thankful and proud of all of you. Four weeks has gone by since I had been called to pick up a very damaged little Staffie. 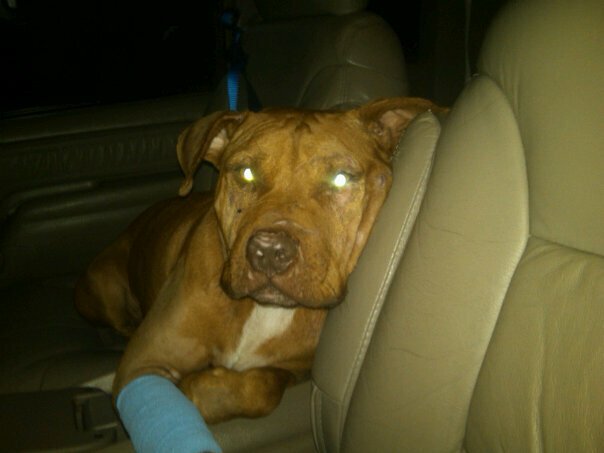 The night I picked him up I was enraged to think someone could be so cruel and uncaring. Someone watched this very loving dog be attacked repeatedly by another dog. They paid no attention to the wounds he suffered, gave no medical care, and they showed no emotion when they dumped him at the shelter, where the outcome would have been death had the staff not fought to find someone to take him. 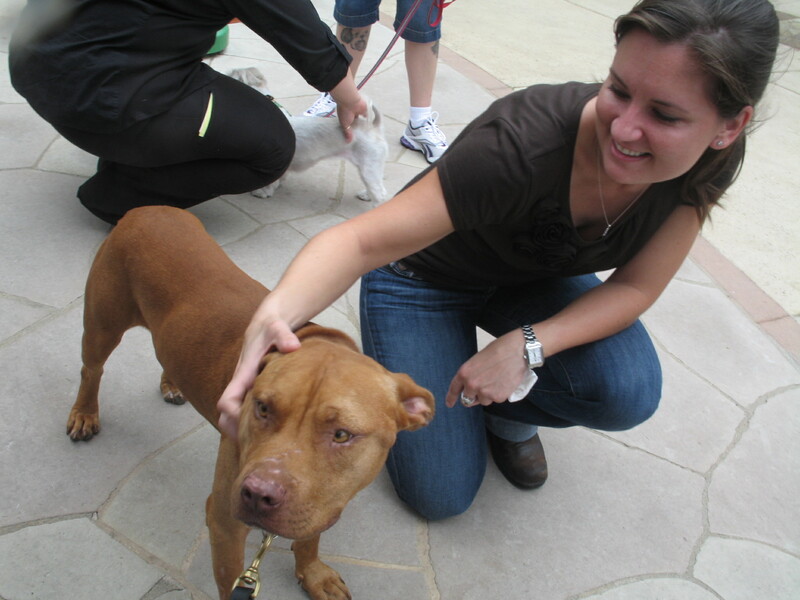 A couple of friends and I had met with the shelter staff after a meeting at the shelter-ironically, a “pit bull” task force meeting. They had been sitting outside of the building with papa on a leash, waiting for the meeting to end, staying after hours to insure he would make it out that night. As we walked up, I was able to clearly see the damage he had endured, sweet little Papa Smurf as the shelter staff called him. 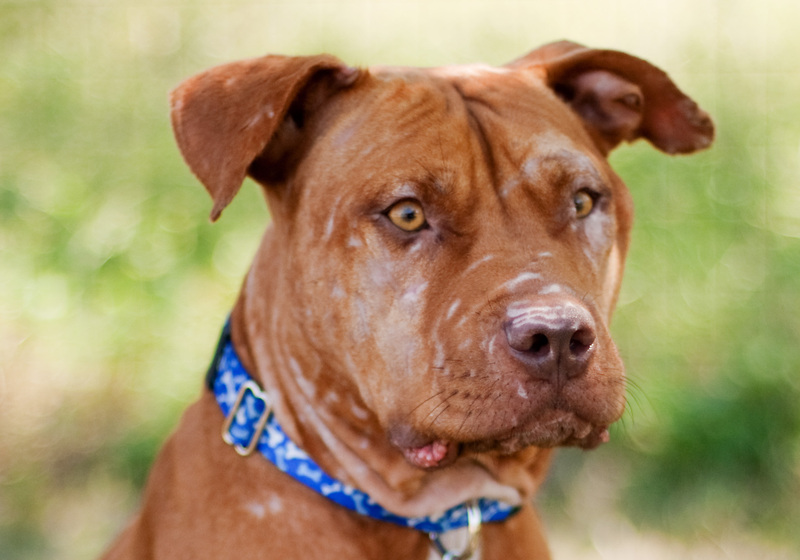 Papa, a petite little guy that had been dumped in the shelter without a care, covered in bite wounds, and yet shows nothing but affection for every human he meets. Looking past those horrible wounds, I must admit it was love at first sight for me and my friends that had come with me. This little guy immediately snuggles into anyone’s arms, puts his head on your shoulder, and softly moans to you as if he was telling you of his past ordeal. 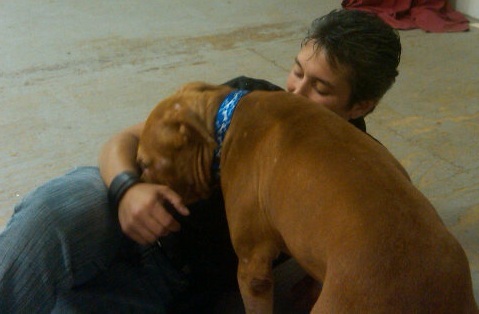 As we walked to my truck to load him up, I began to think about all the dogs I have been asked to take in and help. Was he really any different than them? The dogs our society has given up on, ignored at times when they need our attention the most, left to die lonely and afraid, their last few days in a concrete cell just because they did not fit in someone’s lifestyle anymore? No, he was just like them; a dog that someone treated as a material belonging, cast out without a second thought but he had to suffer through another dog attacking him before he was cast out. For me personally, it meant more. The kennel I had in the back of my truck for some reason was just not right for him. Many dogs had been there before, traveled just fine but why did this one make me think twice? Could it be I had a feeling of guilt for being human? Had I suddenly gathered all the guilt for the cruel things man has done to these noble and loyal beings? This was not my normal working mind; I normally take in a dog and see the future instead of feeling bad for what they had been through. I preach this to all my clients but yet, I found myself placing him gently in the passenger side of my truck where I felt he would be more comfortable. As I hopped into the truck, Papa placed his head on the console over my arm and began to make these very sorrowful sounds. Low moaning, that made me (of all people) tell him “it would be ok”. I suddenly realized this dog had hit a spot inside me that I had turned off, my maternal side. Now don’t get me wrong, I love all my dogs and all my rehab cases just as much as anyone but being in this field for as long as I have, I have always put my dog instincts in charge when I work. The dog instincts I have learned through years of observing, researching, and rehabilitating dogs just like him, so they could go on to live normal lives. I know better than to put my human emotions out there when it comes to working with canines. They follow completely different rules then we do; they thrive on living with someone they can be confident in but yet, I find myself trying to console this badly damaged dog. A half hour on the road and I pull into the entrance of my drive, getting ready to hop out of my truck to open the property gate. Papa stands up and starts trembling and whining, desperately pawing at my arm to keep me in the truck. I stopped and thought if he had done this to the human that dropped him off at the shelter as well. Did he try to plead with this human not to leave him, not to give up and abandon him? How horrible it must have felt for him to watch someone, he no doubt gave a few years of love to, hand over a leash to a complete stranger, turn their back, and just walk away leaving him to possibly die alone and suffer in the pain inflicted by some other dog more worthy than he. Again, I feel the need to console him, gently rubbing his mangled face and telling him I would be right back, my subconscious now screaming at me about my own rules of the first 24 hours of taking in a dog, hello separation anxiety! I jumped out of the truck and raced to open the gate quickly, not wanting to leave him any longer than necessary. As I returned to the truck, he lay back down and started moaning again while placing his head on my arm. Typically, I pull in and close the gate behind me, but not tonight. No, tonight I decide I will not leave him unattended again even for such a short time. I drive up our long drive and park the truck outside our Center. As I put the truck in park, he again started to tremble so yet again, I ignore my professional side and reach over him to untie his seatbelt and carry him through the driver’s side door. His legs work just fine even though he has a tremendous gaping wound on the back of his front leg from the “worthy dog” that had attacked him. Even though he was walking outside the shelter with the caring staff that gave up their evening for him, I am carrying him into the Center. Once inside, I gently placed him down and introduced him to my partner Brandie. He immediately went over to her, buried his head in her lap, and started moaning. Just as I had ignored all my rules, so did Brandie. It has not even been a full hour of meeting him and I find myself on the floor of the Center, at his level and face to face. Where did all my years of experience go? Part of the reason I can turn a dog around so quickly is because I follow the set rules of canine communication and pack behavior yet, here I am ignoring all my past research, experience, and my own safety- face to face on his level with a dog I hardly know. A dog that had been slated for death because society says if he has been in a dog fight and shows dog aggression, it will be unpredictable with humans. Did I really just lie on the floor and throw my theories to the wind? Yes, I certainly did. After spending quite a long time with him that first night, I placed a blanket in his kennel and “tucked” him in for the night. He curled up in a little ball, gave me a very gentle kiss, and laid his head down. I closed up the Center and went on to my own bed thinking about my behavior with this dog. It is so unlike me, what makes this dog different? Again, I ask myself this. The next day we brought Papa to our veterinarian for a full checkup. Just as he had the night before, he seemed panicked by the fact that we placed him in the car. Moaning and holding Brandie’s arm as she drove. No Papa, we are not like the man that left you before. We are not dumping you into a cold cell to live out your last few days watching humans walk past a beat up chain link door and stare at you, some of them, placing judgment without knowing, others feeling bad for not being able to take you home. This is not where this car ride will end. The staff at our vet immediately fell for him the same as we had; loving on him, consoling him. Why? This is a breed so many people immediately change sides of the streets if they see them. A breed most of the world would rather see put to death and banned. What makes this dog any different than the others born with the same “label”? He is full of scars just as so many before him. Society tells us this breed is bred to “kill” yet even professionals that deal with dogs in their worst state of mind daily have forgotten this with one glimpse of Papa. Could society be wrong? The sheer masses of politicians, lawyers, and news reporters we look to for truth? With the visit behind us, we now start the long process of healing. We must apply wet to dry dressings daily to help the deep muscle tear on the back of his front leg close (which turns into three times a day because he rips the bandages off). We have to clean, apply spray, and care for the multitude of wounds on Papa’s face and neck. We must apply eye drops to his left eye twice a day because of the deep puncture he had in the corner of his eye that ruptured his tear duct. He must have oral antibiotics and pain killers twice daily, which we have to place at the back of his mouth because he is smart enough to eat around them. Every day Papa stands completely still for us to do all of this, never needing anyone to restrain him and always thanking us at the end by giving us a gentle chin kiss. He receives acupressure once a week to help in the healing process by a dear friend of mine that immediately feels the urge to “sing” to him and he sits patiently showing his thanks to her as well. His daily routine has now become that of constant medical attention, being caressed by complete strangers that instantly fall in love with him and long walks on the property with other dog, which make him very nervous. He trembles and becomes defensive when a dog barks or shows aggression, understandably so. Every day we get closer and closer to other dogs, teach him commands, and re-teach him social skills. We show him that we, unlike the humans he lived with before, will protect him from other dogs. We will control rudeness and aggression so he can relax. We practice controlled greets with my pack members and have him lay down among them in a calm atmosphere. We reward him for looking away from a challenging stare instead of reacting defensively. We enter week three of our stay together and I have an appointment with a dog that has severe dog-dog aggression. He weighs about 4 pounds and frantically lunges and tries to attack all dogs he sees. Typically I have an intern or Brandie to help me by bringing out one of my very experienced pack members but today I am on my own. Although this is not something I typically do so quickly into a rehab case, I bring Papa out of his kennel and ask the client to hold his leash. I guess one of my reasons for doing this was having the knowledge that the owner followed society’s views. The owners of a dog that has already successfully bitten other dogs and continuously launched himself aggressively at other dog’s necks viewed all staffies as “killers”. As I brought Papa outside and handed the leash over, the owner tensed up and stood completely still, clearly wondering if he would be the next statistic. I then, walked over to help the other owner control her dog. The session lasted about 20 minutes and as I looked over to Papa. I see him lying at my client’s feet, sound asleep. The client is now completely relaxed and calmly talking to Papa. With all quiet, I return to retrieve Papa’s leash and the client tells me he loves my dog. “Yes”, I said, “me too”. The fourth week in and we have a planned event to attend, a local fair to benefit our rescue groups. We had planned on attending and showing our support for weeks now. Brandie and I decide this may be the perfect opportunity to bring Papa out into the public. He needs to practice his social skills in an outside busy environment so this for me, is an ideal training situation. We pack up our needed things, treat bag, treats, his favorite tug toy, and head out on our adventure. He again becomes nervous about getting into the truck but now, he must trust that we will not leave him somewhere. Into the back seat, he climbs and proceeds to place his head on the console between us. No whining, no shaking. We arrive at the event an d out he jumps, a bit nervous by the parking garage sounds, cars zipping by, an echo of a distant dog barking. 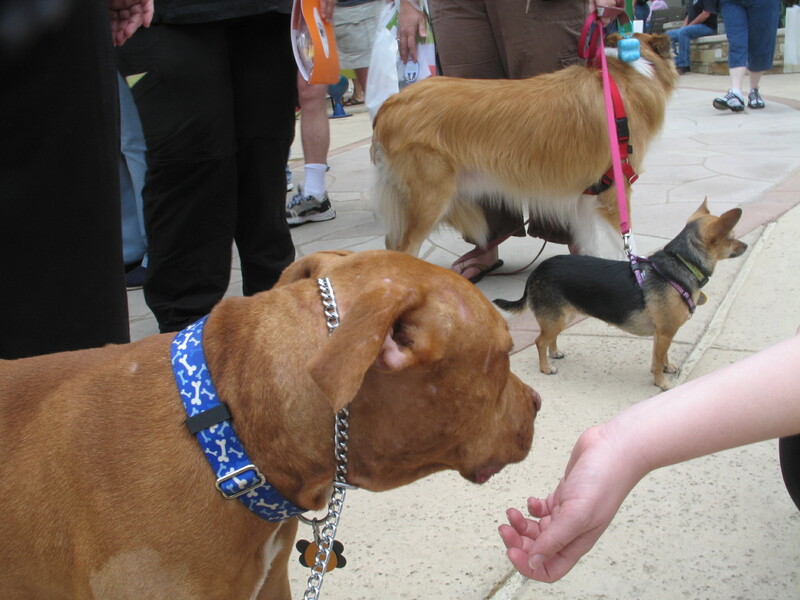 We walk him through and enter the street side fair, wonderfully crowded by people that share our love for animals. The very first booth we visit he starts to tremble and show extreme nervousness, sitting next to me watching everything pass by. I immediately start his working side by applying his “watch me” command to redirect his attention from the multiple dogs pulling their owners past us, rushing up to rudely greet each other. I start to wonder if this may have been too much for him at this stage. After a few body blocks to protect him from his over excited canine friends, he starts to trust that I can protect him and settles down. We begin to walk the fair, myself keeping an eager eye out for dogs that may threaten him while Papa sniffs every inch of the areas we pass including the low hanging purses of the waves of passers-by. This is not the first time I have ventured out with an inexperienced dog; I make it a habit to challenge all the dogs I take in to real life scenes. I do, however, wonder what is going through his mind. Has he ever been in public? Did he ever get a chance to get outside of a fenced yard besides his trip to the shelter? Has he ever experienced masses of dogs, humans, and popping balloons? As the rows of people walk by him, visibly taking extra steps to get a distance away. After all, this is that breed they are warned of. He calmly walks next to Brandie and me only focusing on where we are going next. Before the event, I had told all my clients he would be there hoping he would have some supporters to show him comfort. Of course, I was not disappointed. Papa had many fans show up to support his first day out in the public. An hour went by and Papa had gained enough confidence to approach other dogs. He began to cautiously go up and smell them, staying a little distant at first. With each successful greet he really began to relax and enjoy the company of the other dogs. 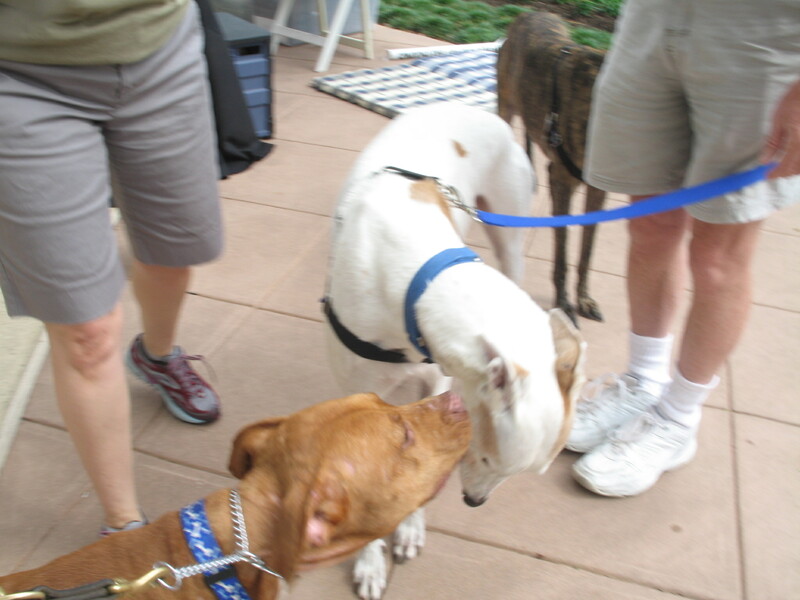 Even gaining enough confidence to go up and kiss other dogs. 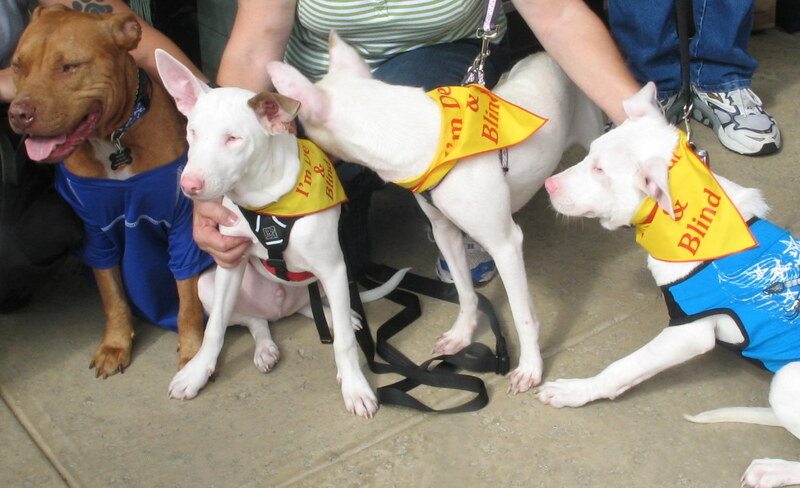 By the time two hours had past, Papa was sitting next to other dogs enjoying his afternoon of making friends. It has been only four weeks for Papa’s life to completely change, and mine. Four weeks that we have spent together, building trust, learning from each other, and changing people’s view of a breed so many hate and fear. Four weeks ago could have been his last day of life; it could have been just another statistic we, in this field, are crushed to see. Papa could have been overlooked and left to die alone because he was born a certain breed as so many others are. In four weeks, this one dog has opened eyes and hearts of every human he has met and completely rebuilt his chance at a new life, all because the people in the shelter refused to be swayed by society. In four weeks, thousands of other Papas are not so lucky; they are the ones we need to feel bad for, the ones we need to fight for, not Papa. No, Papa just made me remember the ones I cannot save, that is what makes him different than the others. With all the hype about how “bad” staffies are, I thought it was time to bring some facts to the public and have a bit of fun with them as well. As you all know, I will not refer to them as “Pit Bulls” as this is not a breed, this is a term dubbed to dogs put in a ring to fight one another. They have “locking jaws”: This is probably my favorite myth about them, the one I get the most laughter out of. I want to meet the person responsible for stating this and personally ask them how much time they spent on Dr. Moreau’s island. I mean really, how many staffies have you seen that were cross bred with reptiles?? Of course this ridiculous myth is FALSE. No canine has the capability to unhinge their jaw and set it to a “locking” position, but every breed of dog does have the capability to hold on to their prey or challenger. Police dogs do this regularly on the job; as many have witnessed, they will hold on to the suspect regardless of the threat they may be under. This is what we, in the dog field, call persistence; which all dogs have or can be taught. How many people with Jack Russell Terriers and small breeds lift them clear off the ground during a game of tug of war? Does this mean they too are from Dr. Moreau’s island?? All will eventually turn on their owners. Although many of the abused, neglected and fighting dogs in my opinion, would be well justified in doing so, again this is FALSE. Since 1900 they have been bred to be farm dogs, military mascots, and family companions. Even the unfortunate dogs that were bred to be dog-fighters had to be exceptional with their humans or they were put down. Human aggression is not allowed, even in the cold-hearted dog fighting community. “Staffies never feel pain”, all I can say is really? Again an uneducated assumption. And we all know what happens when you assume something. 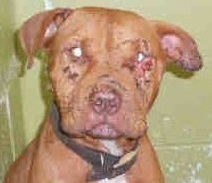 Staffies and all dogs have the same pain threshold; all dogs have a higher threshold of pain tolerance than us humans. They will have a complete hysterectomy (an extensive open abdominal surgery) and be running around the next day, if not the same night. Where we as humans, are off our feet for 2-6 weeks feeling the pain. Search and rescue dogs will literally work themselves to death to find a live human; their handlers have to force them to stop working. Border Collies have been known to work themselves into the ground while herding sheep all day. They have more bite pressure than any other dog, more of the Dr. Moreau fans here; but for all you believers out there, this again was scientifically proven to be FALSE by Dr. Brady Barr of National Geographic. In his television show: Dangerous Encounters: Bite Force, they had tested the bite force of different animals. Using a bite sleeve that was loaded with a pressure gauge, they had a Rottweiler, a German Shepard and a Staffie bite down. Guess which dog had the LEAST force in their bite per square inch, yes the Staffie. I personally think they should have tested a heelers(Australian Cattle Dog) bite force, as in my experience their bite has always been worse than any other breed. All staffies will “eat your children or your face off” someday. Note this is what we hear from people like David Letterman and Judge Judy, both of whom are supposed to be highly educated people, I mean they are after all, on TV right? Sadly they are not reprimanded for this false information, nor are they asked to tell people they have no proof to back up their “racial profiling” of the breed. The dogs that have been identified in children fatalities have been “resident” dogs, which as Karen Delise again so wonderfully describes them: dogs that live their lives on the ends of chains, have no training or social skills, run at large in packs and are intact (not spayed or neutered.) In my own experiences the slim 5 % of staffies that are human aggressive (this is out of 879 cases I have worked with in just the last 3 years) have been the above described cases and have been taught to be more persistent in their bites and attacks by the owners. You can go anywhere on the internet and find information on how to make your dog (any breed) tougher and stronger. Many yahoos on the net will tell you to enhance their prey drive (which controls their persistence level) by using a flirt pole or the ever increasingly popular tree tug. What this does is teach to the dog to bite and hold longer and to chase with more persistence. Does anyone else here see why the owners should be held responsible for the dog’s actions? There are a few dogs that have a naturally high persistence level; terriers of all types are known for it, just ask any breeder. I have seen Jack Russell’s dig until they were bleeding to get to their prey. They can never be with other animals. This is one I love to debate, why? I personally have a staffie and a bull mix that live amongst my pack. Both came to me with issues and both play the “Nanny” to the 2 Chihuahuas. Oh yeah they also live with my declawed cat without issue. Are they prone to be more reactive to other dogs? As much as any other breed out there in my experience. Again, taken from just the last 3 years and 879 cases; I see and rehabilitate an equal amount of staffies and staffie mixes as I do small breeds and sadly the most common truly dog-dog aggressive cases I see are the Great Pyrenese and herding breeds. All dogs can be dog-dog aggressive or reactive if not trained properly. Again this is on the owner, not the breed. We need to step up and truly educate the public. Lets have the owners take the responsiblity of their dogs actions, STOP “racial” profiling breeds because you heard it from a friend/media/stranger/friend of a friend. Seems to me, history proves this is the wrong thing to do in every species, even our own.